Here’s where roller derby is today. There are about 300 female roller derby leagues worldwide, from the Aberdeen Aces in Scotland to the West Texas Roller Dollz, who drew a crowd of 2,000 to their inaugural bout in Lubbock. The racy rough n’ tumble sport is exploding, but in 2001 there was only one league and it was headquartered at a nondescript roller rink off Research Boulevard in North Austin. The birthplace of psychedelic music or the margarita can be debated, but there’s no question that the roller derby revival began in Austin. A mysterious newcomer nicknamed “Devil Dan” came out of nowhere to get the wheels turning, then just as quickly disappeared. “It was a brilliant mix of chutzpah and ignorance,” says April Ritzenthaler, a co-founder of Bad Girl Good Woman Productions, which grounded the freak-show vision of Dan Policarpo by tapping into the spirit of the Red River Street punk rock scene and, thus, reinvented a kitschy sport that had been dormant for decades. Yesteryear’s female derbyites with long-sleeved uniforms and padded leotards, who skated under their real names, have been replaced by tattooed “rock chicks” in short shirts and torn fishnets, with names like “Anna Mosity,” “Lucille Brawl,” “Celia Fate” and “Buckshot Betty.” The new derby girls like their drinks strong, their music loud and their men standing in line to buy tickets. But the early years were not without choppy surf, as an ugly power play led to a skater mutiny in April 2003, which split the original league into two contentious entities. The defectors formed the Texas Rollergirls and skate on the flat track at the Playland Skate Center in North Austin. 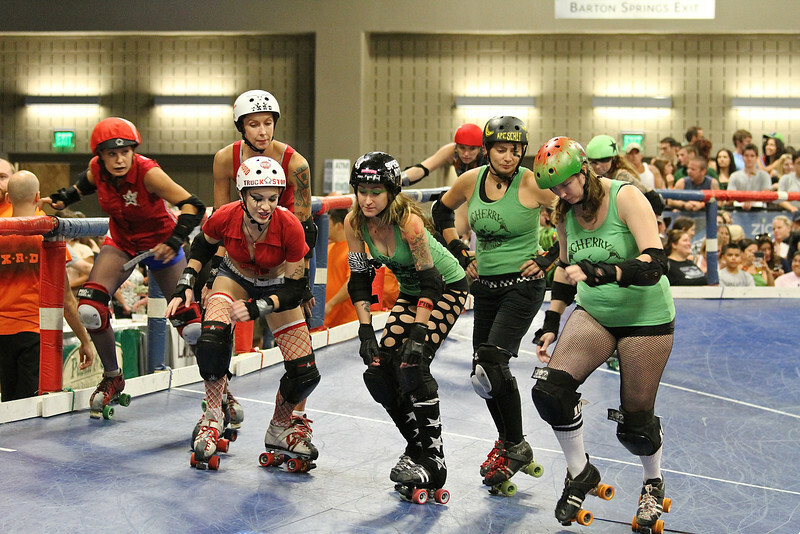 Meanwhile, Bad Girl Good Woman Productions invested in a banked track, named their new league TXRD Lonestar Rollergirls and host their bouts at the Austin Convention Center. Both leagues are thriving, and yet the rivalry remains so fierce that when the “Hell on Wheels” documentary by Bob Ray and Werner Campbell premiered at the Paramount Theatre in March 2007, members of the leagues had to be seated at opposite sides of the theater. There’s a lot to sort out about how Austin came to be known as the birthplace of punk rock on wheels, so let’s have those who were there in the beginning tell the story. Dan Policarpo (Tulsa native who moved to Austin in 1999): I wanted to take a pop culture institution from the past and reload it with new information. It’s like how Throbbing Gristle would take a rock concert and turn it upside down. I’d hang out on Red River and Sixth Street and there were all these aggressive women running around. Some were into the whole tattooed rockabilly look, and I just thought of an all-girl roller derby league. I put up fliers looking for skaters. Bob Ray (Austin-based director of the “Hell on Wheels” documentary): There was some talk that someone suggested roller derby to Dan, but he’s the one who ran with it. April ‘La Muerta’ Ritzenthaler (founding captain of a local team): I didn’t really know anything about roller derby, but I always loved to skate, plus I was about to turn 30, so it seemed like a fun way to feel like I wasn’t getting old. We had a meeting with “Devil Dan” at Casino (el Camino) in January 2001. It was a Sunday afternoon, and I remember thinking that maybe 10 girls would show up. Well, there were at least 50. 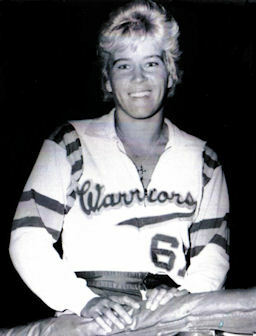 Nancy ‘Iron Maiden’ Haggerty (founding captain of the Hellcats): Punk rock girls didn’t have a sport. You could watch guys play sports or maybe get into a softball game. But then roller derby came along, and it was something that was all ours. Policarpo: What the roller derby has become is a lot more watered down than what I had in mind. I wanted more smoke and mirrors, more like “Rollerball” than roller derby. There was a circus in town at the time and I wanted it to be like that, but more extreme, like clowns fighting each other with knives. Ritzenthaler: We came up with the team names and the captains at that first meeting. Anya (Jack) had a huge tattoo of a cowgirl, so her team was the Rhinestone Cowgirls. Nancy (Haggerty) had a black cat tattoo, so she named her team was the Hellcats. Amanda Hardison (who left after a few months) had been a Catholic schoolgirl, so her team was the Holy Rollers. Rachelle ‘Sparkle Plenty’ Moore (ex-Rhinestone Cowgirl who co-founded the Texas Rollergirls flat-track league): In the first few months it was just party girls hanging out in bars and talking about something that may or may not happen. Only a few of us even knew how to skate. Ritzenthaler: Dan raised sponsorship money from Casino and Emo’s, but he couldn’t be trusted, as we soon found out. We never saw any of that money. We had our first benefit in March of 2001, and all these bands agreed to play, but when we showed up, there was nothing there. No p.a. No free food and beer, as Dan had promised. It was $10 to get in and when he’d finally collected enough money at the door, Dan went over to Rock N’ Roll Rentals and rented a p.a. Policarpo: I spent all that money renting the Mexican Cultural Center, which cost $300, and a lot of other expenses. The girls were supposed to sell tickets and give me the money back, but they just kept the money. I spent $600 or $700 on that event and only got $150 back. Ritzenthaler: We had all these big meetings with all these crazy dreams, but you can’t have a grand vision without crazy dreams. When roller derby was founded by a Chicago promoter in 1935, it was an endurance contest along the lines of dance marathons, with skaters going round and round for several hours at a time. Sometimes a skater would extend an elbow or swing a hip to gain an advantage and if a scuffle ensued, the audience would come to life. The promoter took note, and the derby slowly became a contact sport, with the rules soon evolving to the way they are today. Points are scored when a designated skater (“jammer”) laps a pack of skaters from the other team, who do their best to block out the opponent’s jammer, while propelling (whipping) their lead skater around the cluster. Judy Arnold, the golden girl. theatrical event in which the home team always won. But soon after the 1975 retirement of golden girl Judy Arnold, who found religion and started a ministry that’s still going, the roller derby packed it in. There have been attempts to revive the toughest sport on wheels, including 1999’s “Roller Jam” on the Nashville Network, which featured a figure 8 track and an alligator cage, but nothing’s come close to the current punk rock circus on wheels, where none of the skaters get paid and the scores are real. Ritzenthaler: We had practice at 8 a.m. every Saturday morning. It was the only time Skate World would give us. A lot of us worked in the bars on Red River every Friday night until 2 or 3 a.m., so you’d have to really drag yourself down there at 8 in the morning. From that meeting in January 2001 until the first bout, 18 months later, we had 150 girls come through roller derby. Most of them didn’t stick with it. Moore: After we had our first real game (August 2002) and finally had a product, things started to get weird. The She-E-Os (team captains Ritzenthaler, Nancy Haggerty, Heather Burdick and Anya Jack) wanted a stronger hold on it. The skaters were funding it by paying ($25) dues every month, paying for their practices and the equipment, and yet we were told that we didn’t have a stake in it. We knew that if just the four (She-E-Os) ran it, they were going to run it into the ground. I said it to their faces. The new alterna-derby became an instant success, with crowds doubling with each bout until sellouts were the norm. In town to film an episode of “Insomniac” for Comedy Central, comedian Dave Attell devoted a chunk of the Austin segment to the tough, brawling rollergirls in plaid schoolgirl dresses. Then Jane magazine did a spread. The secret was getting out and catching fire in message groups. Ray: The (She-E-Os) decided that they shouldn’t skate anymore. They were the de facto owners, though it wasn’t clearly defined yet and that became an issue later, when it came time to form an LLC. Who would own it? That’s what led to the split … When council removed themselves from skating daily with the mob and competing, they handed off a lot of the responsibilities to the new team captains, so there was this huge separation. That created an atmosphere of us versus them. Haggerty (She-E-O and founding captain of the Hellcats): The three of us (Ritzenthaler had recently resigned) were spending a million hours a week on every aspect of putting this thing together, from production, marketing, budgeting … and I guess our mistake was not letting the other girls see how hard we were working. If you show up early and help with the practice or if you put up fliers, that’s not the same as carrying the weight of failure or success every single night before you go to bed and when you wake up. That’s what we went through. Conflict on the track during bouts was nothing like what was going on behind the scenes. First was the 2003 calendar fiasco. Without putting it to a vote, the She-E-Os spent $7,000 of the league’s money on producing calendars that didn’t come out until January, when most folks had already bought theirs. That venture eventually lost $5,000 for the cash-strapped league. Then on March 15, 2003, during an exhibition match at the Austin Music Hall, skater Whiskey L’Amour suffered a badly broken leg. Because of a mix-up, the league’s insurance did not extend to the music hall. As captured in “Hell on Wheels,” league members met around a backyard bonfire behind Sara “Lunatic” Luna’s House, demanding the She-E-Os sign a contract giving the skaters a share of ownership of the league. But the raging fire ended up as a fitting metaphor for the evening’s flareup between two opposing entities who both refused to budge. Sixty-five of the 80 Bad Girl Good Woman Productions skaters walked out on the meeting and started their own league. Haggerty: What wasn’t in the movie (“Hell on Wheels”) was that the papers they wanted us to sign had us admitting that we were incompetent. No way we’re signing that … All of us three felt that the split was harder on us than our divorces. There were so many more layers to it. You couldn’t avoid (people talking about the split) wherever you went. It shook me to my foundation so much that when I quit (in 2005), I assessed everything in my life. Everything! Not one thing stayed the same. Moore: When we formed (the 100 percent skater owned) Texas Rollergirls, it was just amazing. That Dave Attell thing (a segment on the roller girls on Comedy Central’s “Insomniac”) aired, and the interest was way up there. We had a full house at our first bout. Then we found out that Bad Girl Good Woman changed the name of their league to Lonestar Rollergirls, and I was just crushed. We were really trying to separate ourselves from them, working hard on marketing “Texas Rollergirls,” and then they came out with that name that sounds so much like ours, and it just lead to confusion. I was ready to put the past behind us, but that name change just stirred up that animosity all over again. Haggerty: They stole everything they could from us; even the team names and concepts. (Their league) was a complete copy of ours … We were supposed to be so incapable of accomplishing anything without them, according to (the defectors.) So how was it that we managed to start right back up again, with a banked track no less, in three weeks and make it better than ever? Ray: When “Hell on Wheels” (which filmed from December 2001 until late 2003) premiered at the South by Southwest Film Festival in March 2007, we had to sit the skaters from each league as far away as we could from the other league. It was crazy. During some scenes one side of the Paramount was cheering while the other side was booing. And vice versa. Haggerty: A guy who was starting a New York league said to me once, “I can barely do this and I can look at what you did as a model. How the hell did you do this with no model?” The kind of people who have the skill set to forge ahead no matter what and who don’t listen to people who say it can’t be done and who ruin their health working toward an obsession, are usually not going to be the kind of people who are diplomatic when it comes to people’s feelings or realizing the impact they’re having by not going to a practice. We had that narrowness of vision and passion and grit, or whatever, and maybe that just wasn’t the right skill set to manage it. Although Ritzenthaler has returned to manage her old team, none of the three She-E-Os who built the pioneering league from the ground up (Haggerty, Jack and Burdick) is still involved with the roller derby on an active basis. Their banked-track league, TXRD Lonestar Rollergirls, is currently 100 percent skater owned. June 23, 2002: The dress rehearsal, an invitational bout at Playland. August 4, 2002: The first public bout at Playland draws 400 fans. At the championship bout two months later, more than 1,100 tickets are sold. March 15, 2003: Roller derby comes to SXSW at the Austin Music Hall with Nashville P performing. Whiskey L’Amour suffers a badly broken leg. April 2003: Unsatisfied with management’s refusal to relinquish control, most of the skaters walk out on Bad Girl Good Woman Productions and start a new skater-owned league called Texas Rollergirls. June 2003: BGGW Productions buys a banked track from an old-school roller derby promoter in California. They call their new league TXRD Lonestar Rollergirls. June 8, 2003: Texas Rollergirls debut at Playland. July 3, 2003: The new high octane roller derby gets first national exposure on Dave Attell’s ‘Insomniac’ show on Comedy Central. July 19, 2003: TXRD Lonestar Rollergirls have first bout on the banked track at the Travis County Exposition Center. Most of the skaters have trouble adjusting to the new track, and the Expo Center proves too cavernous. August 4, 2003: Texas Rollergirls, Austin’s flat-track league, are featured on ‘Good Morning America.’ It’s the one-year anniversary of the first public bout. August 1, 2004: The New York Times writes about the roller derby revival spearheaded in Austin. January 2006: A&E’s “Rollergirls” reality show, which follows the Lonestar Rollergirls, airs. Because of so-so ratings, the somewhat contrived show is canceled after the first of two planned seasons. March 2007: The documentary ‘Hell on Wheels,’ produced by Werner Campbell and directed by Bob Ray, debuts at SXSW. Late summer 2008: Based on the Austin-based book ‘Derby Girl’ by Shauna Cross, the Drew Barrymore-directed film “Whip It!” is set to begin filming in Michigan and Austin. December 2008: The New York Times profiles Devil Dan. 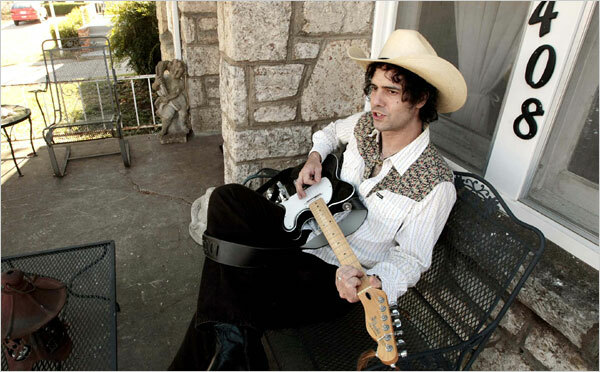 Devil Dan in Tulsa, 2008. Photo from New York Times. This entry was posted on July 7, 2013 at 5:09 pm	and is filed under Uncategorized. You can follow any responses to this entry through the RSS 2.0 feed. You can leave a response, or trackback from your own site.